Is the room cluttered or clean? Are there minor repairs or updates needed? 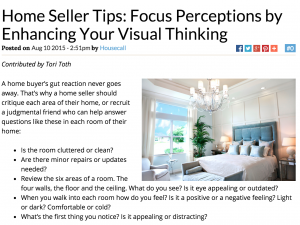 Review the six areas of a room. The four walls, the floor and the ceiling. What do you see? Is it eye appealing or outdated? When you walk into each room how do you feel? Is it a positive or a negative feeling? Light or dark? Comfortable or cold? What’s the first thing you notice? Is it appealing or distracting?